Dust from DIY projects. Dirt from soccer cleats. Pet hair. A clean house can be hard to keep up with – but it’s important nonetheless. Everyone wants to be able to have a clean kitchen, nice neat bedrooms, and sparkling bathrooms. Some people believe that the only way to keep up with the demands of house cleaning is to use harsher cleansers like bleach and some think that you can’t get as deep a clean with more natural, eco-friendly products. The truth is you can. Eco-friendly products have developed to become more effective and efficient. Plus it gives your family other benefits too. No toxins: Eco-friendly cleaning products are usually made of natural ingredients that aren’t harmful to people or the earth. This can make you feel better about using products around your pets and your kids. Save money: Some eco-friendly products can actually save your family money. While they may cost more per bottle or container than traditional cleaning products, they aren’t as watered down as many traditional products on the market. With more cleaning power per container, you save more money over time. Earth-friendly: If you’re worried about your impact on nature, you know you can’t just stop cleaning, but natural cleaning products won’t damage ecosystems or hurt the earth. Using eco-friendly products can help you do your part to protect the environment. Reduce allergies: Many people find that they’re allergic to the ingredients in traditional soaps, cleansers, shampoos, wipes, and other cleaning products. Whether it’s a rash or other irritation, eco-friendly products can help clean your home without triggering an allergic reaction. Greener, more natural, or eco-friendly cleaning products can help you have a safer, more productive cleaning experience at home. 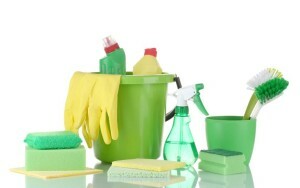 Cleaning might be a chore, but it doesn’t have to be a hassle. Get a happier, healthier, cleaner home with the eco-friendly products like some of the great cleaning and home items we have in stock now.